One chair, four slipcovers. It’s amazing how each slipcover gives the same chair a completely different personality! The wingback chair featured in these photos is mine. It’s worn & loved and, yes, it has 4 (or more) slipcovers. Years ago, I did a pin fitting on it and created a reusable slipcover pattern. Now, whenever I get the urge to update my decor, I pull out my pattern and tweak the details to design an entirely new look for my old chair. 1. Enhance your furniture’s best features. Design your slipcover to show off one or more of the unique design elements on your chair or sofa such as arms, legs, arches, wings, etc. 2. Choose a slipcover fit that matches your personal style. Is your style loose and shabby chic? Snug contemporary? Or, relaxed and tailored? 4. Pick a timeless fabric and color for long lasting design appeal. Classic fabrics such as denim, canvas, twill, ticking, linen and matelassé in slipcover weights (10 to 14 oz.) will add longevity to your slipcover. Neutral colors offer the most flexibility when it comes to decorating. 5. Match your slipcover function to the fabric. 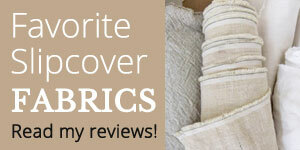 When choosing fabric consider how you will use your slipcover. If your slipcover will get heavy traffic and require frequent washing go with a durable, heavy weight fabric. If you want your slipcover to be pet and/or kid friendly avoid brushed fabrics (pet hair magnet) and textures that snag easily. And, for occasional use slipcovers that are mostly decorative a medium weight fabric, solid or novelty, will work fine. This entry was posted in armchair slipcovers, inspiration, slipcover design and tagged custom slipcovers on August 7, 2017 by slipcovermaker.